I was recently given the chance to screen the new theatrical movie, Voiceless, a film that tackles the controversial pro-life vs. pro-choice debate. In the film, a young war veteran returns home and becomes a community outreach leader. He puts his job, and life, on the line to stand against an abortion clinic that has opened up across the street from his Philadelphia church. 1. 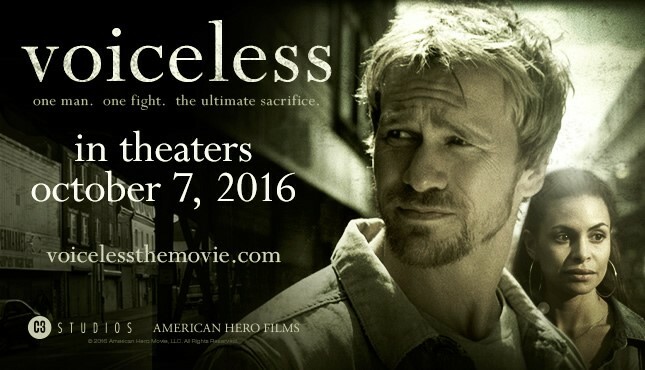 The premise of the movie is about getting the church involved in making a difference in the pro-life/pro-choice debate. One man cannot do it all, and shouldn’t have to. 2. The topic was presented in a way that both sides of the issue were addressed. 1. The plot was dragging in several places. 2. There were several scenes that were not necessary. Some of them showed the main character seeing a psychologist after his discharge from the military, helping him debrief from active duty. Others showed him confronting his anger issues. These scenes did not fit the plot line or the main idea of the movie. They weren't necessary because they didn’t add anything to the point of the movie. 3. Instead of using the above scenes, I think it would have been better to add more scenes about the importance of prayer, where the church members (and the main character) are praying about the clinic across the street and how God wants them to make a difference. Overall, the movie didn't really keep my full interest, but it was not a bad movie; and I believe it could be a good tool to use in churches as a discussion starter on the topic.